Host to some wonderful music festivals and also a recording studio. This shooting ground is handy for Inverness as it is sited just to the South of the city on the A9. You can even catch the A34X bus which stops nearby! 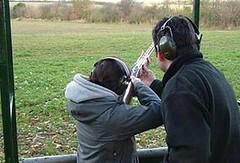 With 60 clays you can really get into the swing of target shooting however good you are. By the time the 60th clay has shattered on the ground you will be confidently tracking them in flight and hitting them with your shotgun. Session duration depends on the group size. Bookable morning and afternoon. Please note session needs to be pre-booked.